iPhone 7 audio disease has become so common that we’ve decided to post a little more info about typical symptoms and what can be done to address this. 1) No audio – when making a phone call, you will not be able to hear the person on the other end of the line, and they will not be able to hear you. If you click on voice memo and try to create a recording, you will get a “recording failed” message. 2) Boot looping – your iPhone may begin to just hang on the Apple logo endlessly. The home button will still click, but the iPhone will not boot up all the way. Apple has not done much to address the issue, nor have they acknowledged this design flaw. They will simply offer to replace your device for $300+. Luckily, we are able to repair this problem, and best of all, prevent it from happening in the future by adding small micro jumpers to the affected pad(s). The repair involves getting under a microscope and using a hot air rework station to remove the audio IC chip, reball it, and add a micro jumper to the C12 pad. Check out some of our work below! We will repair your device the same day and have it shipped back the following morning. We cover the cost of USPS return shipping and tracking. 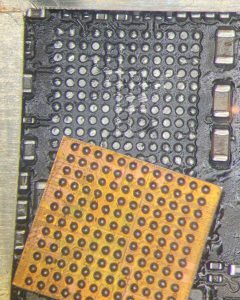 If you are a repair shop looking to outsource microsoldering repairs like these, contact us today – we offer volume discounts! If you have any questions or concerns, shoot us an email (info@bostoniphonerepair.com), and as always, thanks for reading!